(Nanowerk News) A research team at Bielefeld University has succeeded in teaching the only robot of its kind in the world how to walk. Its first steps have been recorded in a video. You can watch them in Bielefeld University’s latest posting on ‘research_tv’. The robot is called Hector, and its construction is modelled on a stick insect. Inspired by the insect, Hector has passive elastic joints and an ultralight exoskeleton. What makes it unique is that it is also equipped with a great number of sensors and it functions according to a biologically inspired decentralized reactive control concept: the Walknet. By 2017, the walking robot will be equipped with additional abilities in a major project at the Center of Excellence Cognitive Interaction Technology (CITEC). The walking robot has been built by the Biomechatronics research group. In the future, Hector should serve as a platform for biologists and roboticists to test hypotheses about animal locomotion. One major aspect will be the fusion of large amounts of data from sensors so that the robot can walk more autonomously than before. A further key issue will be the optimal coordination of movements by a robot with elastic drives. ‘The way that the elasticity in Hector’s drives acts is comparable to the way that muscles act in biological systems,’ says Professor Dr. Axel Schneider. He is heading the Biomechatronics research group and is coordinating the CITEC project together with Professor Dr. Volker Dürr from the Department of Biological Cybernetics at the Faculty of Biology. Schneider and his team developed the elastic joint drives themselves. Hector has 18 such joints. Through the biologically inspired elasticity of the drives, Hector can adapt flexibly to the properties of the surfaces over which it is walking. ‘However, elasticity alone is not enough for Hector to be able to walk through a natural environment containing obstacles,’ says Schneider. 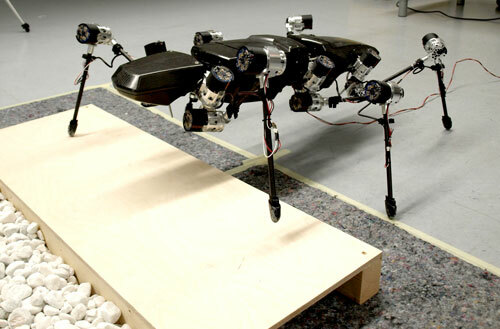 ‘The challenge was to develop a control system that would coordinate the movements of its legs in difficult surroundings as well.’ Schneider’s colleague Jan Paskarbeit was responsible for developing and building the robot. He also programmed a virtual version of Hector in order to test experimental control approaches without damaging the robot. ‘All sub-systems have to communicate with each other for the robot to walk without any difficulties,’ says Paskarbeit. ‘Otherwise, for example, Hector might have too many legs in the air at one time, become unstable, and fall over. Moreover, the legs have to be able to react to collisions with obstacles. We have dealt with this by implementing a reflex behaviour for climbing over objects,’ explains the CITEC researcher. At the CITEC Center of Excellence, eight research groups have joined together for three years in a large-scale project to optimize Hector. The scientists come from the fields of computer science, biology, physics, and engineering. Currently, the researchers are working on equipping Hector‘s front section with far-range sensors as in a head. They already have a prototype with two lateral cameras and two tactile feelers. Both the visual and the tactile systems are inpired by those of insects – their work spaces and their resolutions are similar to those of animal models. ‘A major challenge will now be to find an efficient way to integrate these far-range sensors with the posture sensors and joint control sensors. Hector is the ideal research platform on which to do this,’ says Volker Dürr. The research on Hector is the outcome of a series of earlier research projects. For example, the functional parts for Hector were manufactured in the CITEC project ‘MULERO’ and in the project ‘ELAN’. ‘ELAN’ was financed by the Federal Ministry of Education and Research. In the EU project ‘EMICAB’, Axel Schneider’s and Volker Dürr’s teams collaborated with three further European teams engaged in research on intelligent motion control in insects and robots. For Dürr and his team, this involved evaluating motion sequences in stick insects in order to understand the control mechanisms in the insect’s nervous system and transfer these to computer models. A further stage in the construction of the robot was the design and manufacture of the robot body. A green and white design model was developed with designers from the Folkwang University of the Arts in Essen and engineers at the Leibniz Institute of Polymer Research in Dresden. The casing of the robot is now black, because it is made of carbon-fibre-reinforced plastic (CFRP) to save weight. The CITEC Center of Excellence is spending 740,000 Euros on the current Hector major project entitled ‘Embodied Interaction as a Core of Cognitive Interaction’.